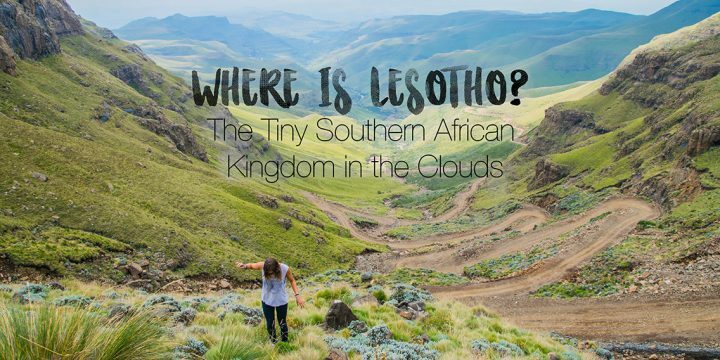 If you have ever heard of the tiny little kingdom, you may have asked yourself, “where is Lesotho?” It’s not an obvious point on the African map, and it’s so small it often goes overlooked. 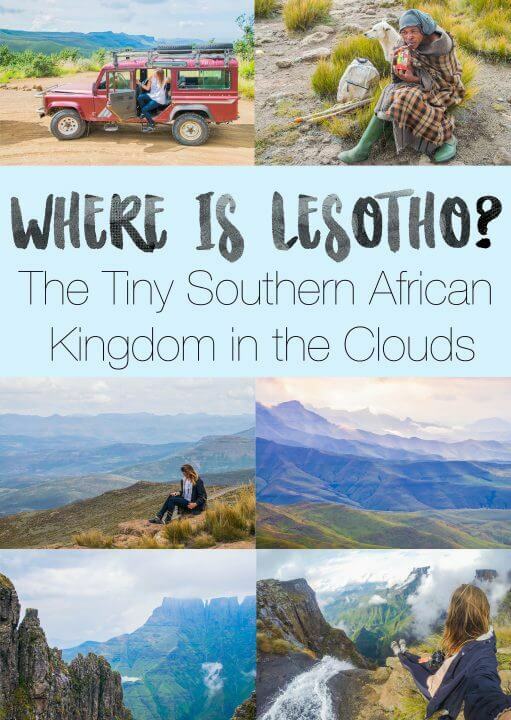 But those who do end up finding Lesotho (pronounced Leh-soo-too) are undeniably happy that they did. 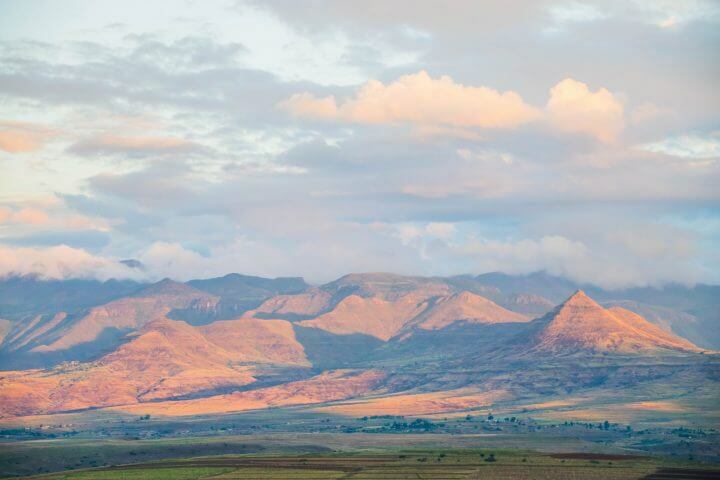 Lesotho is one of the most scenic and beautiful countries that I have ever had the pleasure of visiting. It is inexplicably beautiful, its people are incredibly kind, and the culture is fascinating as well. Related: See my Cape Town Guide for adventures & sunsets (& other tips too!) in the Mother City! 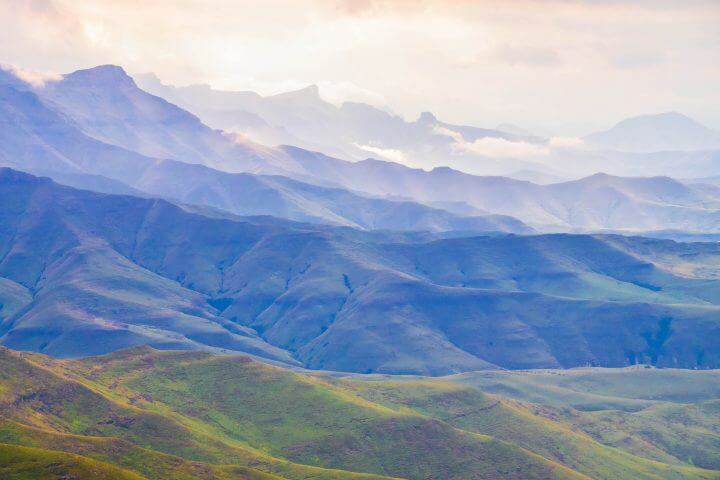 Most of Lesotho’s eastern border is dictated by the Drakensburg Mountains. These are technically mostly in South Africa, but most of the range runs along the border and spills over into Lesotho as well. 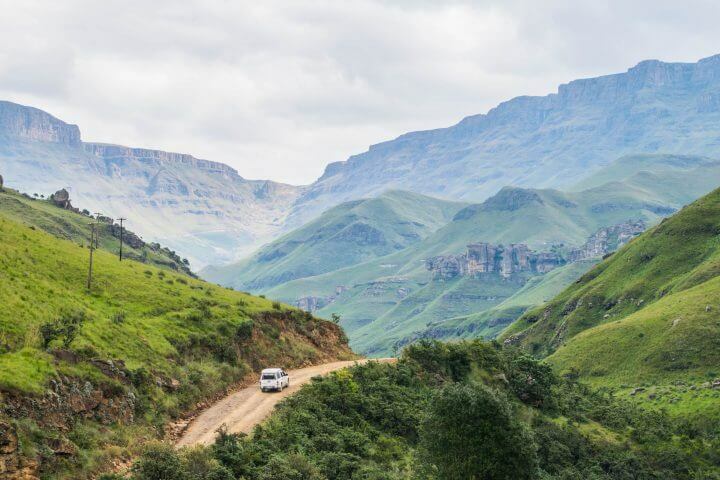 The Drakensburg are home to some of the most famous hikes in the world, including the Cathedral and Amphitheatre hikes and also the trek to Tugela Falls, the second tallest waterfall in the world! 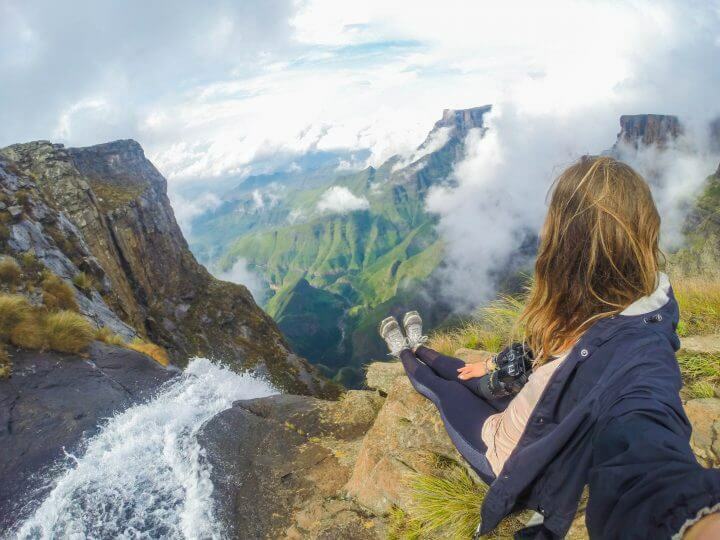 I had the pleasure of taking part in this Tugela Falls trek, and it was probably the top hike of my life. We trekked up through dense fog, with views of the dramatic vertical Drakensburg cliffy mountains disappearing and reappearing from view. We got to see the top of Tugela Falls and had a brief moment of clarity to see all the way into thousands of meters of rippling green canyon while the fog was in a lull. The photos I took this day are by far some of the best of my life, as were the views. I can’t wait to get back to hike more there! One of the most interesting ways to enter Lesotho is by the Sani Pass. This is a zig-zagging, steep dirt road that winds up the mountainside near the Drakensburg on Lesotho’s east coast. Oftentimes the guards at this border will stamp you both in and out of the country at the same time, because they know you are just spending some time enjoying the highly elevated and stunning mountain views, and that it’s much easier to exit the same way you came in than to navigate your way through these rural mountain roads. 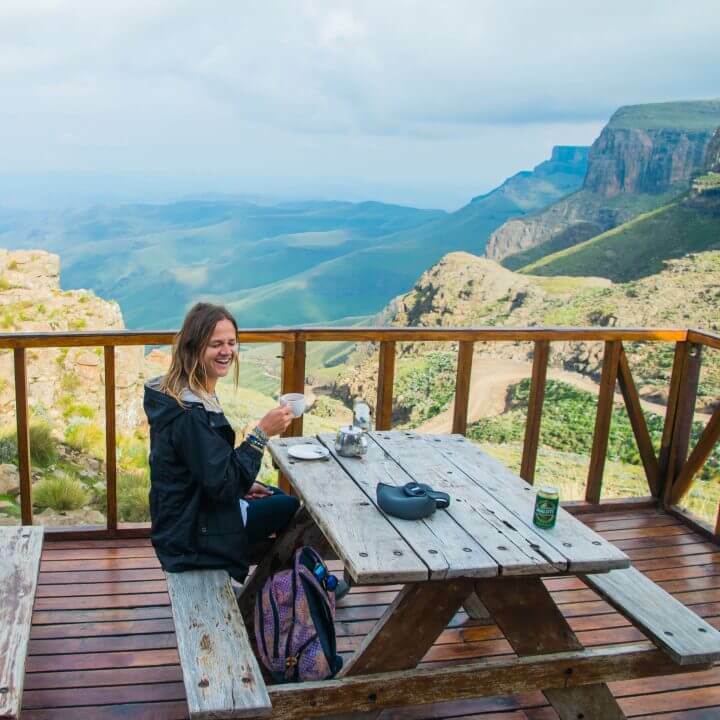 As soon as you get to the top of the Sani Pass, you have the opportunity to visit Africa’s highest pub. This pub is at a steep elevation of 2874 meters, and you will not find a higher one on the entire continent! They have all possible kinds of drinks, from alcohol to coffee & tea to warm you up at the chilly elevation. The pub is decorated with all sorts of photos and mememtos to make for a warm and inviting atmosphere. 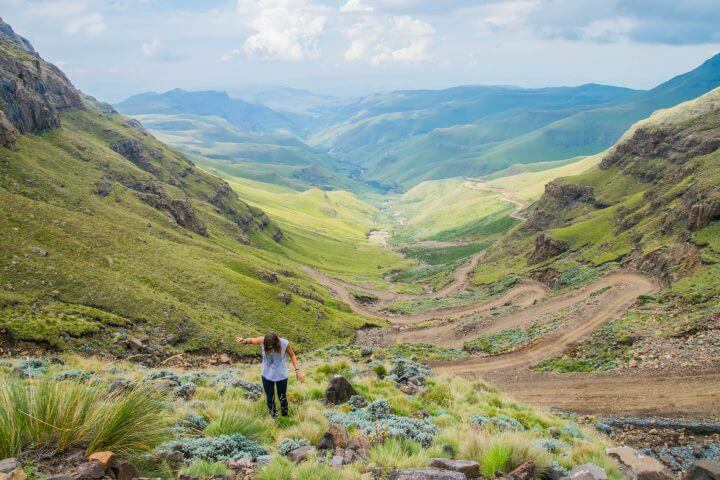 If traveling through, you can book a tour of the Sani Pass as a convenient tour from Underburg in South Africa! 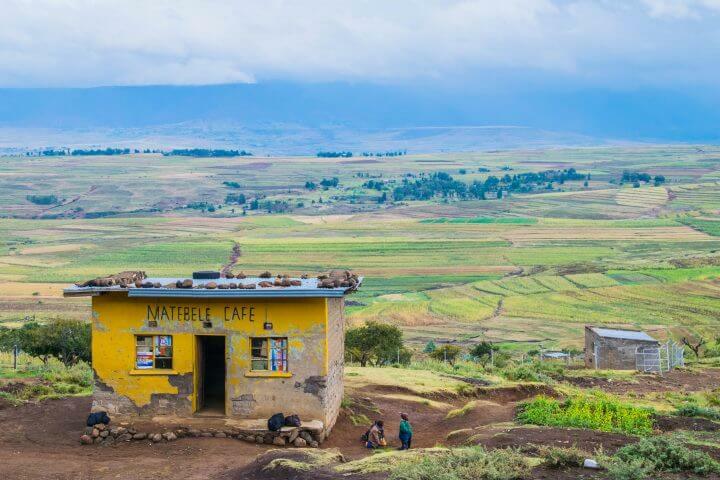 I visited Lesotho on my African Tour with Acacia Adventure Holidays. These run from 3-58 days and can be accommodated or camping tours depending on your route and countries. Overland tours are the best way to travel in Africa; they run in a big overland truck with camping and cooking equipment so you can rough it in deserts, bush, and forests! 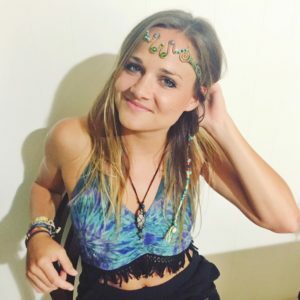 I camped the 40 Day Southern African Adventurer Tour from Cape Town to Cape Town (at an employee discount – see How I Afford to Travel), but you can book many different legs of this journey or different journeys all together. Other amazing overland routes: Kenya to Cape Town (longest + most epic tour!) // Nairobi to Livingstone/Vic Falls // Joburg – Botswana – Joburg (Accommodated) // Joburg/Kruger to Cape Town (southern/garden route) // Cape Town to Windhoek (All of Namibia – my favorite part!) // Cape Town to Zanzibar and tons more! Check the link above for all tours. If you are considering an African Overland Tour and need any help planning, leave me a comment/email! As you can probably imagine, life up at this high of an elevation is not for the faint of heart. Near the Sani Pass and through the rural Lesotho mountains you can find lots of mud huts, which are the classic way of living, and lots of nomadic shepherds. Residents actually make their huts out of cow dung and straw, and live simply by making fires for warmth and either selling goods, offering tours of their homes for tourists, or cooking. 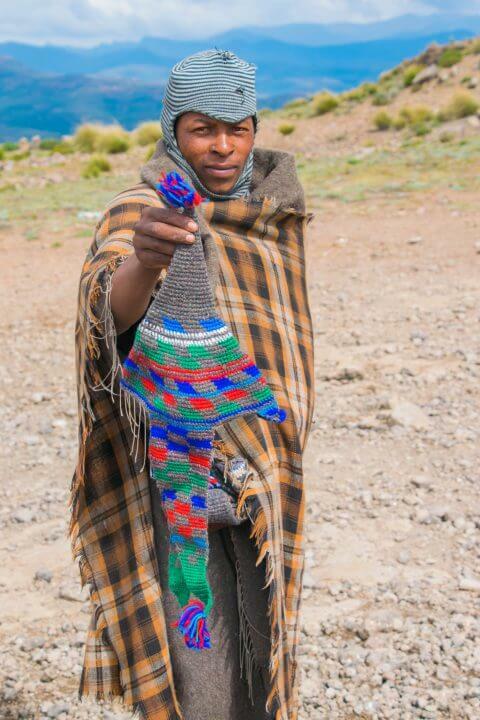 Lesotho has many nomadic shepherds that traditionally wear a thick wool blanket pinned over their shoulders. These shepherds walk miles and miles a day with their sheep, and often sell knitted goods or accept food in exchange for a photo with tourists. Sheep are a big industry in this country, and shepherds must live 6 months a year high up in the mountains tending to their sheep. Related: 29 Bizarre Swaziland Facts that will Blow Your Mind – learn about this incredible nearby country! Most of Lesotho’s bigger towns, including its capitol, are in its western half. Most residents live in these towns at least for part of the year or to go to school. Many of them are still very hard to get do (treacherous dirt roads!) and mountainous, and may offer lots of hiking, horse riding, biking, or other adventure activities through the beautiful terrain. I stayed a few nights in Malealea, which was another stunning part of the countryside. Malealea is situated upon one of the many rivers that run through Lesotho. The lodge we stayed at offered hikes, bike rides, and pony rides along the river shores and down into the canyons. We visited some ancient bushman paintings and were able to collect some beautiful crystals scattered across the hillsides. I have no doubt that many of the other towns were similarly charming, remote, and scenic! So now you know, where is Lesotho? It’s not too far from Durban and the rest of South Africa, and is 10000% worth a trip. You can stay at Amphitheatre Backpackers if you want to do a guided trek of the Drakensburg, or Malealea Lodge is where I stayed in Malealea. Learning about the people and culture is fascinating and quite different from South Africa, and the people are welcoming and full of pride. I have dozens more photos of this beautiful country… See more of my Lesotho photos or buy prints by clicking to my photo site here! 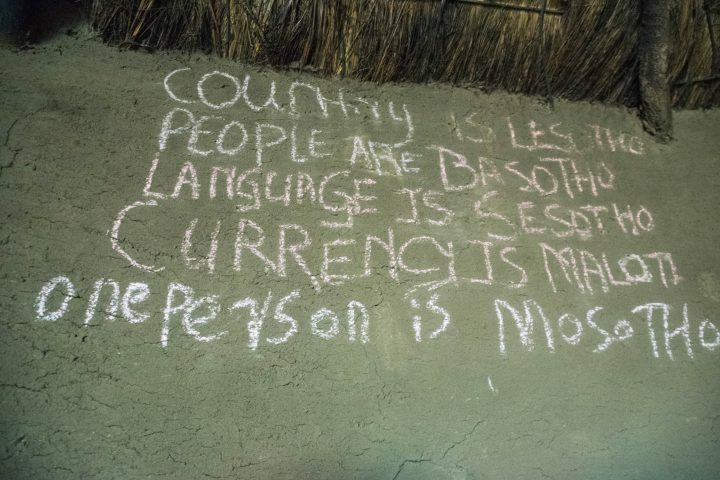 And yes, this is actually how they call their country, people, language, person, and currency – as written in a mud hut we visited!